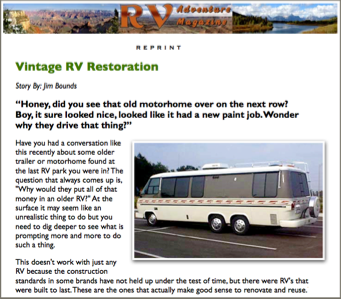 Jim Bounds assembled a document entitled Vintage RV Restoration for an online magazine, RV Adventure. That magazine was not financially successful and was taken down in 2009. GMC Eastern States received permission to reprint and redistribute that article. Jim operates a facility in Orlando, Florida that specializes in repairing and fully restoring vintage RVs and trailers. For more information and lots more pictures about this intriguing process, visit Jim’s website, Cooperative Motor Works, or call Jim at: 407-857-5777. According to Jim, the question that always comes up is, “Why would they put all of that money in an older RV?” At the surface it may seem like an unrealistic thing to do but you need to dig deeper to see what is prompting more and more to do such a thing. Mr. Bounds points out that renovation doesn’t work with just any RV because the construction standards in some brands have not held up under the test of time, but there were RV’s that were built to last. He uses the GMC Motorhome as the primary reference point in this article noting that they actually make good sense to renovate and reuse.The wood frame covered with siding units fell to the wayside years ago so if you actually see one of them out and about it would be in rough condition not suited to renovate. Motorhomes, notably Airstream models and the classic, front-wheel drive GMC’s were some of the engineer-designed coaches while Airstream and Avion, among other classic travel trailers, were also designed and built in a manner that lend themselves to being updated and reused today. Get the complete document in PDF from this clickable link.